DeAraujo Salon is a full service salon that features a wide range of services. Our Cut & Style menu features haircuts that include shampoo, blow dry and style, bang trims, haircuts for teens and children, and special bridal package, which is by consultation only. Ask about our Master Stylist haircut for amazing results, as well as our Makeup Application service. Our color experts at DeAraujo Salon can provide you with a wide range of options, creating subtle tone changes or the brightest statements in the latest popular colors for teens. We also offer a wide variety of colors, including pigments that use all-natural organic ingredients. Additional treatments include a deep conditioning treatment, botanical therapies, glossing shine, Keratin, hair relaxing and perms. At DeAraujo Salon, we take time to consult with our clients to help them choose the best hair style based upon facial structure and skin tone. We work with you to learn about your hair goals. Our stylists create a look that is as unique as you are. Call today for a FREE consultation. If you have never gotten a salon blow out at DeAraujo Salon before, you are in for a treat! Professional salon blow outs are designed to help your hair look red carpet ready, giving you gorgeous, luxurious hair that goes beyond any other treatment. 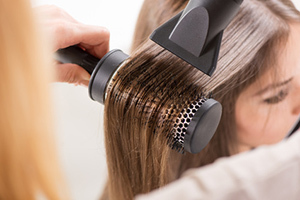 Affordable, quick and safe for any type of hair, salon blow outs at DeAraujo Salon are a great way to look your very best without investing a fortune – or a ton of time. Choose from several options at DeAraujo Salon, including an add-on curling iron or specific processes, including sleek & smooth or waves. DeAraujo Salon also offers a wide range of professional hair removal services. For facial hair, choose from eyebrow shaping services, upper lip, chin, side burns and neckline hair removal. We also offer a variety of services for arms, legs, chest, back and stomach. Check out our specialty hair removal services, including bikini and Brazilian waxes for both men and women. DeAraujo Salon features NuFree Nudesse, which is known as the most effective hair removal treatment in the world. Developed over 25 years ago to help plastic surgeons remove hair prior to surgery, NuFree is carried by thousands of professional salons all over the globe. NuFree is not a wax, does not stick to the skin, doesn’t dry and can be erased at any time. It is completely botanical and is safe for use anywhere on the body. Complete the pampering process with one of our professional nail services. DeAraujo Salon can provide you with many different styles of manicures and pedicures to help you look your best. Choose from styles for special occasions or everyday colors. 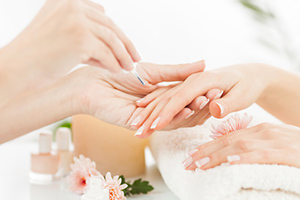 Our nail services menu includes our Essential Manicure and Pedicure, as well as a French Manicure. Make sure to ask about our Vinylux Weekly Polish, a revolutionary breakthrough that endures for a full week of fashion perfection, all without a base coat. The patent-pending ProLight Technology is activated with exposure to natural light, delivering week-long wear. Our Shellac Brand polish provides 14+ days of high-performance wear and features a stunning crystal shine. DeAraujo Salon wants to fully transform your life, so not only do we offer various hair, skin and nail services we recommend visiting Cloud 9 Spa for your massage needs. If you suffer from back pain, stiff joints, spasms and cramping or you just want to alleviate stress and worry from your life… massage can help. Massage can also lessen the effects of depression and promote tissue regeneration, reducing scar tissue and stretch marks. To book massage services please contact Cloud 9 Spa at (508) 993-0699. Cloud 9 Spa are our recommended massage provider, and are conveniently located in the same building!